“What man artow?” says the Host to Chaucer the pilgrim. The Host makes fun of Chaucer for staring at the ground all the time and for being a fat little doll for ladies to toy with. The Host asks Chaucer to tell the company a merry tale, and Chaucer says he will give them a rhyme he learned long ago. Chaucer gives a modest, ugly depiction of himself as a shy, bumbling, fat little man who doesn’t have any sort of backbone around women. His tale is similarly lame: it's a foolish childhood tale. Raphel, Adrienne. "The Canterbury Tales Prologue to Sir Thopas." LitCharts. LitCharts LLC, 8 Nov 2013. Web. 21 Apr 2019. Raphel, Adrienne. "The Canterbury Tales Prologue to Sir Thopas." LitCharts LLC, November 8, 2013. 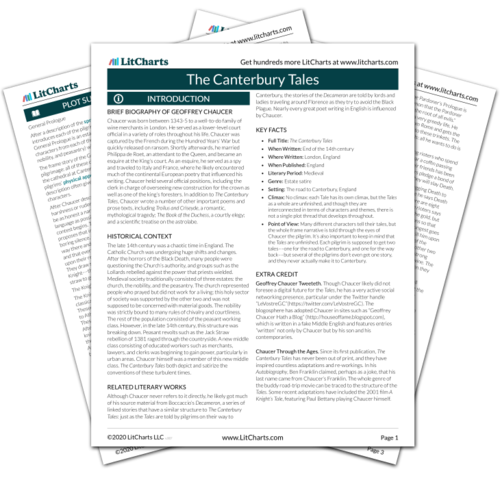 Retrieved April 21, 2019. https://www.litcharts.com/lit/the-canterbury-tales/prologue-to-sir-thopas.